WHEN you meet Miguel Ángel Milián, you get the clear feeling you have come upon a priest of the land. He was born in Yayabo, is in his 40s, and for two decades now has lived for cattle ranching. He is a strong man, but calm, and everyday, believe it or not, devotes at least 10 minutes to petting his animals and conversing with them. 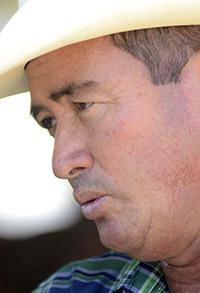 The owner of El Cacique, covering 34 caballerías (approximately 460 hectares) of land, and 760 animals, works with the state farm El Ruano’s breeding program and the Ramón Ponciano food enterprise in Fomento, a prestigious entity in charge of distributing meat contracted by the state throughout the entire country. 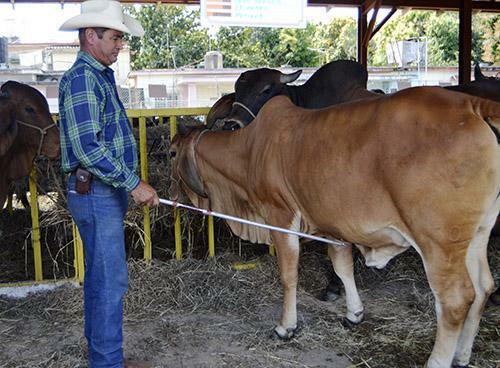 Bursting with pride, he tells Granma International about the recent approval of his participation in the country’s artificial insemination and genetic programs, a clear recognition of the quality of his cattle. It is clear that his cows are able to understand instructions from human beings. They are taught to carry a rope without difficulty, follow a person, and stand correctly. That is to say, they learn to obey human commands. Milián reports that what is evaluated in competitions is the animals’ docility; how rapidly commands are obeyed; if they stop and change hooves when told. He always uses a handler’s prod, without being violent he corrects the cow’s moves. In the expert’s opinion, contrary to what many may think, cassava is essential to a cow’s diet, and his stock eats 10 pounds of feed and five of cassava every day. “I am especially fond of a cow named Nobleza, who was born on my ranch. My youngest son Mario Ángel and I live for this one. What I love the most is teaching. So everyday I spend some time with my animals. Even if I have other responsibilities, and the workers take care of what I did before, I don’t lose touch,” he concludes with pride.